Subramanian was the Dennis Weatherstone Senior Fellow at the Peterson Institute for International Economics and Senior Fellow at the Centre for Global Development in the US before joining the ministry. 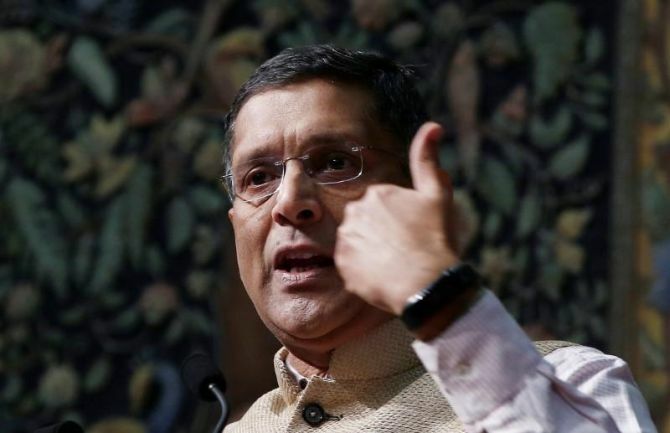 Chief Economic Advisor Arvind Subramanian will be leaving the finance ministry after nearly 4 years because of "pressing family commitments" and return to the US, Union Minister Arun Jaitley said on Wednesday. Subramanian was appointed as CEA to the finance ministry on October 16, 2014 for a period of three years. In 2017, his term was extended for a year. "Few days ago Chief Economic Advisor Arvind Subramanian met me over video conferencing. He informed me that he would like to go back to the United States on account of pressing family commitments. His reasons were personal but extremely important for him. He left me with no option but to agree with him," Jaitley wrote in a Facebook post. The minister, however, did not say as to when Subramanian will relinquish office. "Profoundly grateful & humbled by these extraordinarily generous words by Minister @arunjaitley announcing my decision to return-for personal reasons-to researching & writing. CEA job most rewarding, fulfilling, exciting I have ever had. Many many to thank," Subramanian tweeted minutes after Jaitley's Facebook post. Jaitley further said that on expiry of Subramanian's three year term in October last year, he had requested him to continue for some more time. "Even at that stage he told me that he was torn between family commitment and his current job which he considered the best and most fulfilling he has ever done," the minister said. Jaitley, who was the finance minister before undergoing a kidney transplant surgery in mid-May, also thanked Subramanian for his contribution to macro economic management of Indian economy. "Personally I will miss his dynamism, energy, intellectual ability and ideas. He would walk into my room - at times several times a day, addressing me as “Minister” to give either the good news or otherwise. “Needless to say his departure will be missed by me. But I know that his heart is very much here. I am sure he will keep sending advice and analysis wherever he is," he wrote. Jaitley said that Subramanian's early diagnosis of the twin balance-sheet had led the government to adopt the macro-economic strategy of higher public investment in the Budget of 2015-16. "He conceptualised JAM (Jan Dhan, Aadhar, Mobile) as a data base for availing public benefits. He contributed to the debate of federalism by conceptualising that the Indian federalism has not merely to be cooperative but also competitive. “He came out with newer ideas, policy reforms in the sectors of clothing, fertilisers, kerosene, power and pulses," Jaitley said. Recalling his contribution on formulating the Revenue Neutral Rate, Jaitley said "it was of great use in forging a consensus which led to the constitution amendment enabling the GST. He participated in every meeting of GST, gave his independent views and was heard in rapt attention by almost every Finance Minister". Subramanian, the minister added, elevated the quality of the analysis and the presentation of ideas for public deliberation in his four "Economic Surveys". "His documents for four years was treated by several independent critics as one of the best ever produced... The Economic Survey today is a basic teaching material all over India," Jaitley noted. During his tenure, Subramanian came out with futuristic ideas on rationalisation of removal of "subsidies for the rich", universal basic income, climate change, and the four C's -- courts, CAG, CVC and CBI -- that had historically paralysed decision making. He also conducted the first online course on Indian economy for the benefits of students and teachers across the country. Besides, he launched the government's online education platform 'Swayam', which became one of the most followed courses in India.